Datalogics offers two StudioRIP Screening technologies available as optional add-ons to the Adobe PDF Print Engine. Seamlessly integrate these SDKs with your custom RIP to produce both 16-bit AM and FM screens of very high quality and utilize variable sized droplet technology in inkjet printers. These screens can be used in print workflows powered by both Adobe PDF Print Engine and Adobe CPSI. StudioRIP's 16-bit technology enables better precision than the default screening in Adobe PDF Print Engine and Adobe CPSI. StudioRIP's technology is able to produce 4096 shades of gray, even with line screen and resolution combinations like 150 lpi at 1200 dpi. Unwanted patterns caused by the dot gain of the imagesetter/CTP are automatically filtered out resulting in smooth, pattern free halftones. Additional color precision, enabled by a low-pass filtering system that smoothes dot gain spikes, offers perfectly linear behaviour after calibration. Consistent rosettes offer perfect rosette consistency even on large format, high resolution, and special angles. Variable Sized Droplet Screening is an efficient way to achieve fine halftones at high speeds without sacrificing quality. While the current standard of using high resolution and small droplet size (e.g. 1440×1440 dpi @ 3.5 pl) results in high quality but low printing speed, Variable Sized Droplet Screening uses relatively lower resolution and variable sized droplet (e.g. 720×720 dpi @ 3.5, 7.0 and 12 pl) to produce comparable quality and much higher speeds. 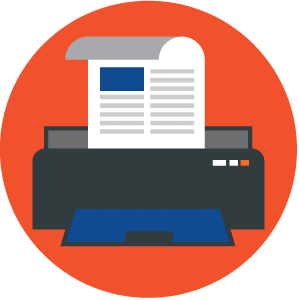 Print Service Providers (PSPs), print OEM solution providers, and designers will also be able to specify an unlimited amount of droplet sizes so as to take advantage of future inkjet printing technology as it is developed.